The goal of our hike along Hancock Avenue was to reach the famous outer “Angle” of the stone wall, an important location during Pickett’s Charge on July 3, 1863. 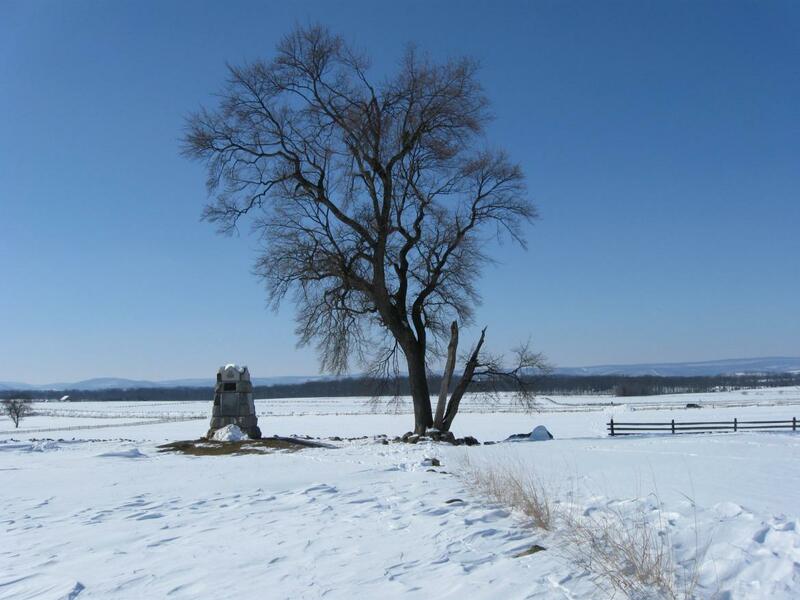 The tree is growing out of the “Angle.” The monument is to the 71st Pennsylvania Infantry Regiment. This view was taken facing west at approximately 1:00 PM on Friday, February 12, 2010. 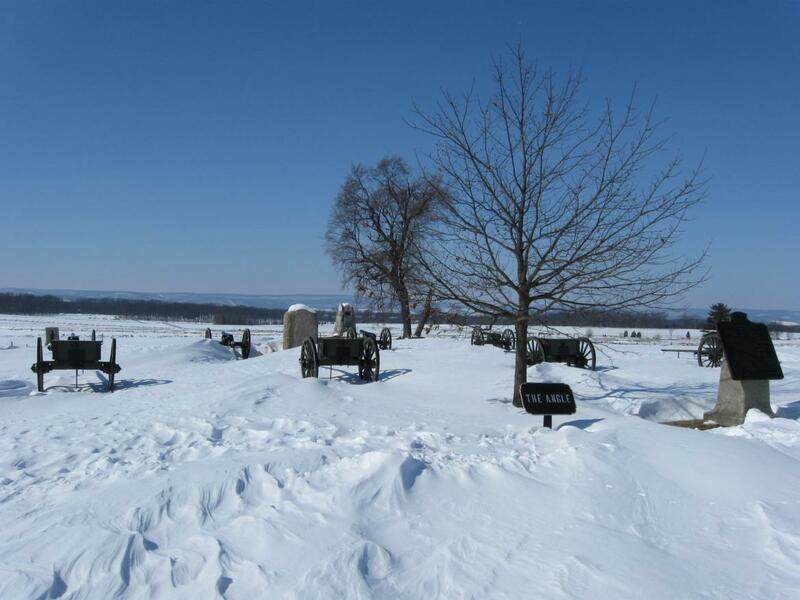 The Gettysburg area received another big snow fall beginning Tuesday afternoon (February 9th) and ending the evening of Wednesday February 10th. 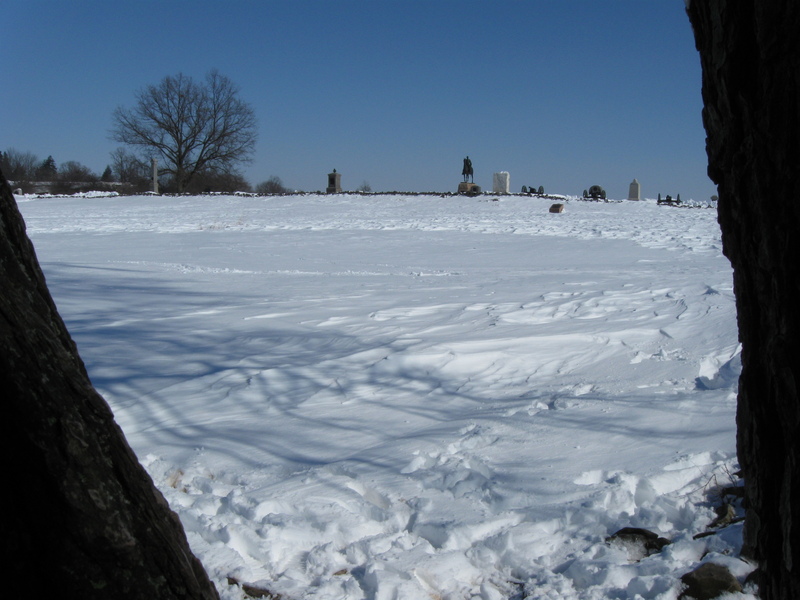 We briefly made it out on Thursday, and took a Bushman Farm panorama, but we were able to spend much more time in the Cemetery Ridge area on Friday. In our first post, we’ll saw some photographs of Pleasonton Avenue, and scenes around the Pennsylvania Monument area. In in our second post we trudged along the unplowed/unploughed Hancock Avenue towards the High Water Mark area. 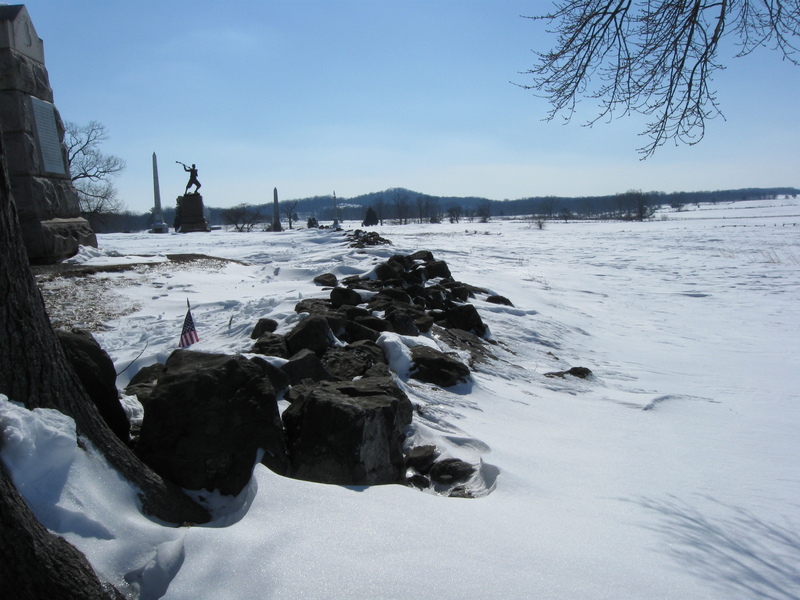 In today’s post we show the pictures that we took in Gettysburg National Military Park’s Angle/High Water Mark area. The fenced in Copse/Clump of trees is on the left. 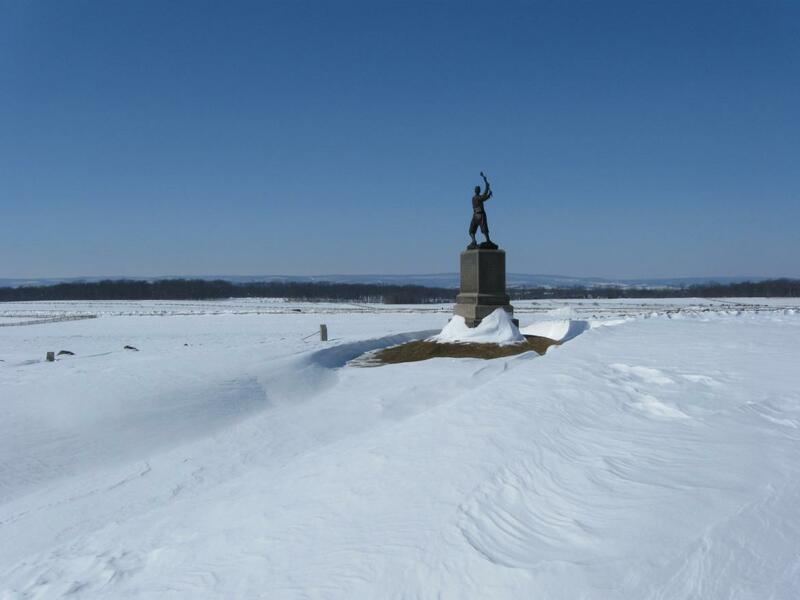 The monument is to the 69th Pennsylvania Infantry Regiment. 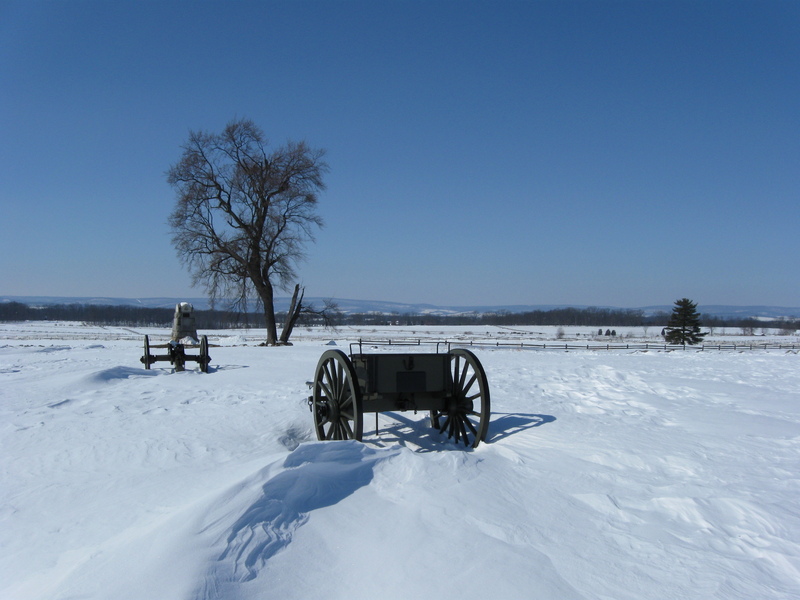 Seminary Ridge is the first treeline in the background. This view was taken facing west at approximately 1:00 PM on Friday, February 12, 2010. The 1891 monument to the 72nd Pennsylvania Infantry Regiment has the soldier with his rifle raised. The tree is growing out of the outer Angle of the stone wall. 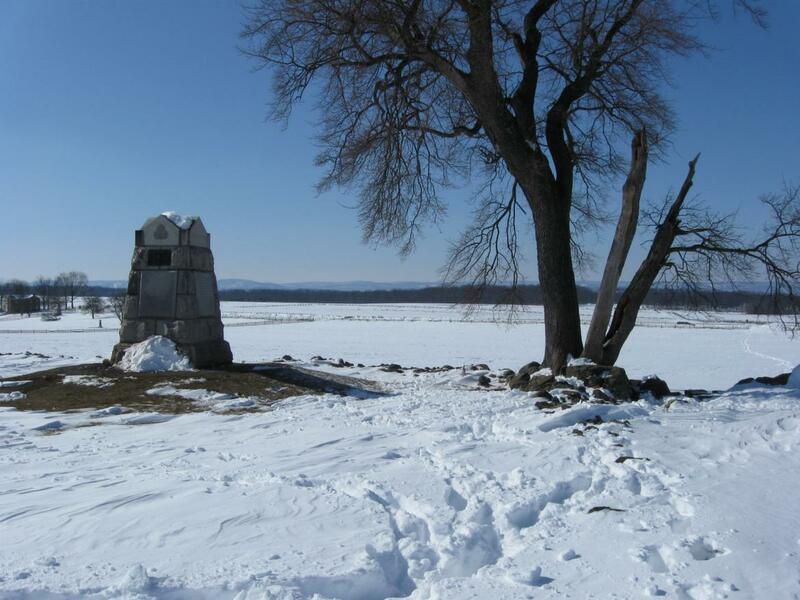 The monument to the 71st Pennsylvania regiment is to the left of the tree. This view was taken facing northwest at approximately 1:00 PM on Friday, February 12, 2010. The tree growing out of the stone wall is in the left background. 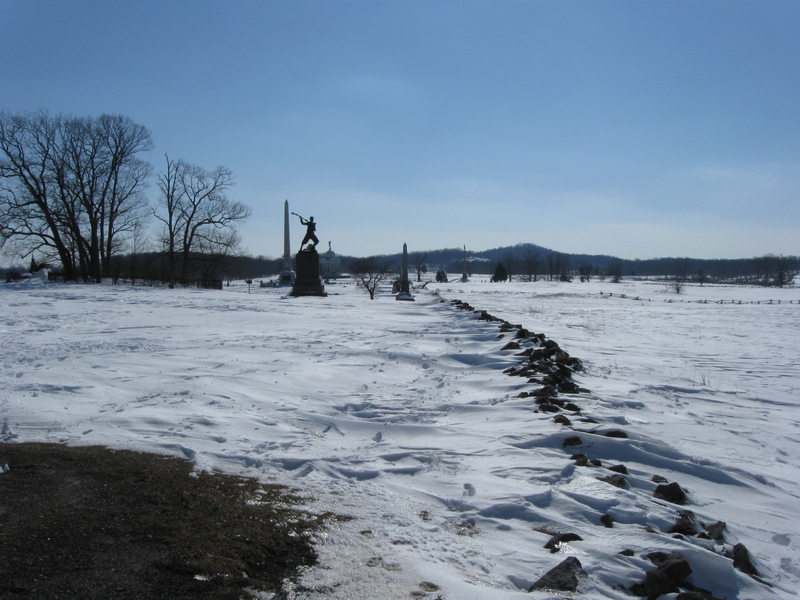 The monument closest to the camera is the 1883 monument to the 72nd Pennsylvania Infantry Regiment. 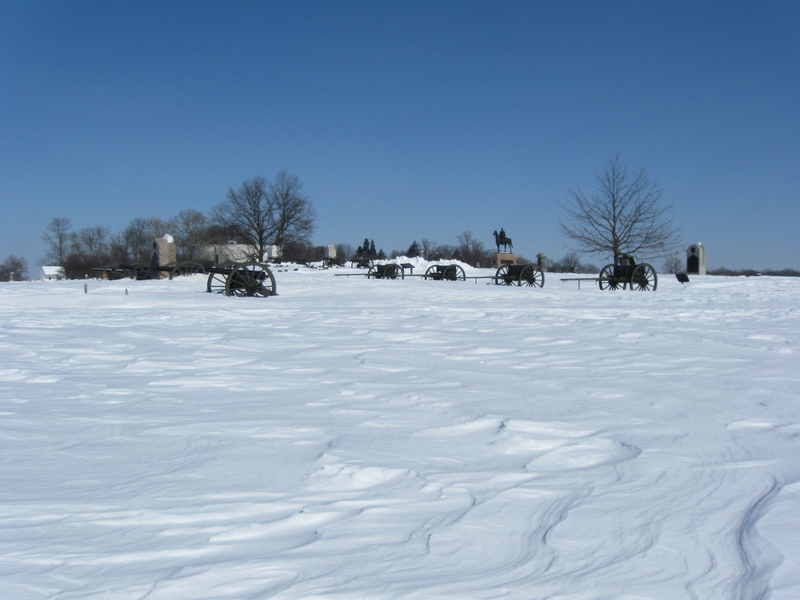 The artillery pieces and limbers mark the position of Lieutenant Alonzo Cushing’s Battery A, Fourth United States Artillery. This view was taken facing northwest at approximately 1:00 PM on Friday, February 12, 2010. 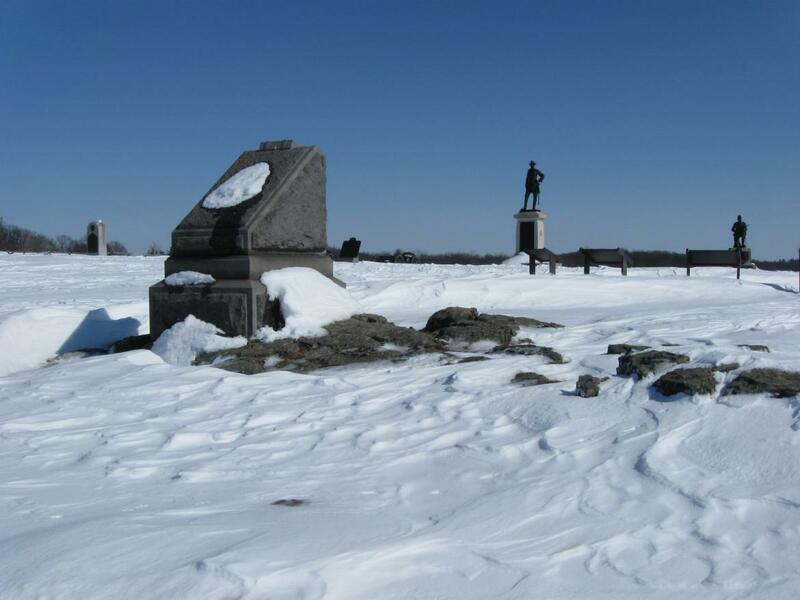 The 1883 72nd Pennsylvania Monument with Cushing’s guns and limbers in the background. On the far left is the marker to Confederate Brigadier General Lewis Armistead. This view was taken facing north at approximately 1:00 PM on Friday, February 12, 2010. The 1883 72nd Pennsylvania Monument. The tallest statue in the background is to Brigadier General Alexander Webb. 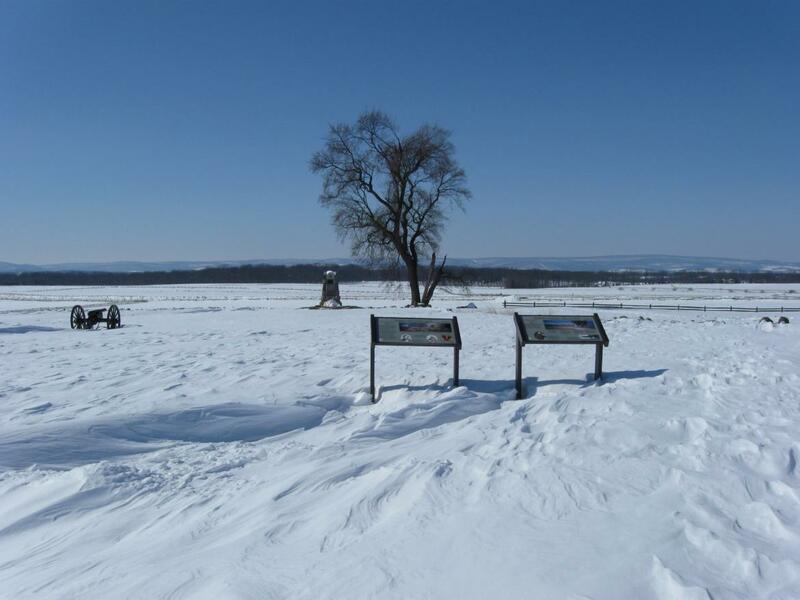 This view was taken facing northeast at approximately 1:00 PM on Friday, February 12, 2010. 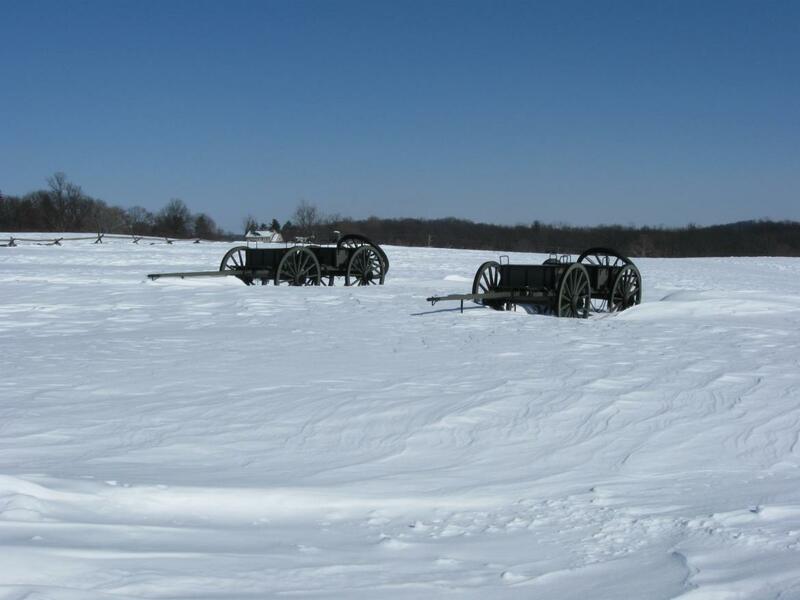 Cushing’s Battery. The equestrian statue in the background is to Major General George Gordon Meade. 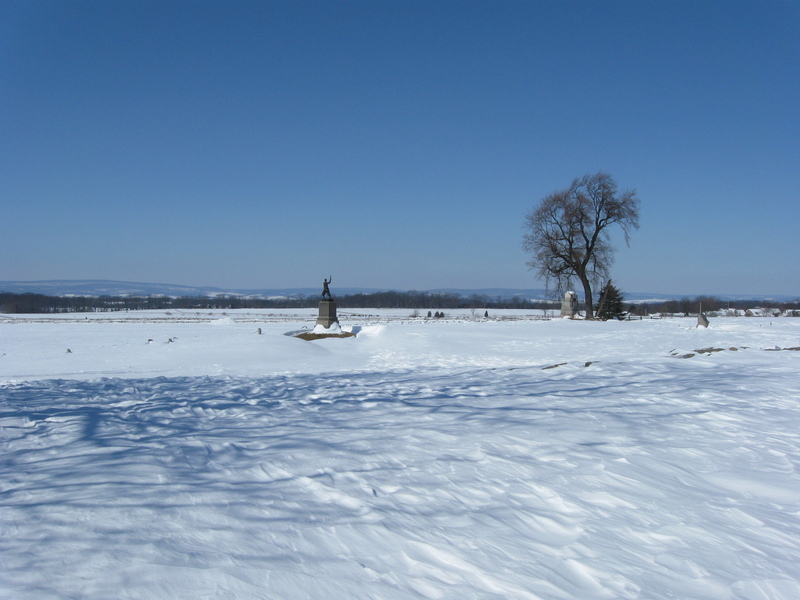 This view was taken facing northeast at approximately 1:00 PM on Friday, February 12, 2010. The 1891 monument to the 72nd Pennsylvania Infantry Regiment. This view was taken facing northwest at approximately 1:00 PM on Friday, February 12, 2010. Before we go to the outer Angle, we’ll go back to Hancock Avenue. The primary waysides here have had the snow fall off. This view was taken facing west at approximately 1:00 PM on Friday, February 12, 2010. 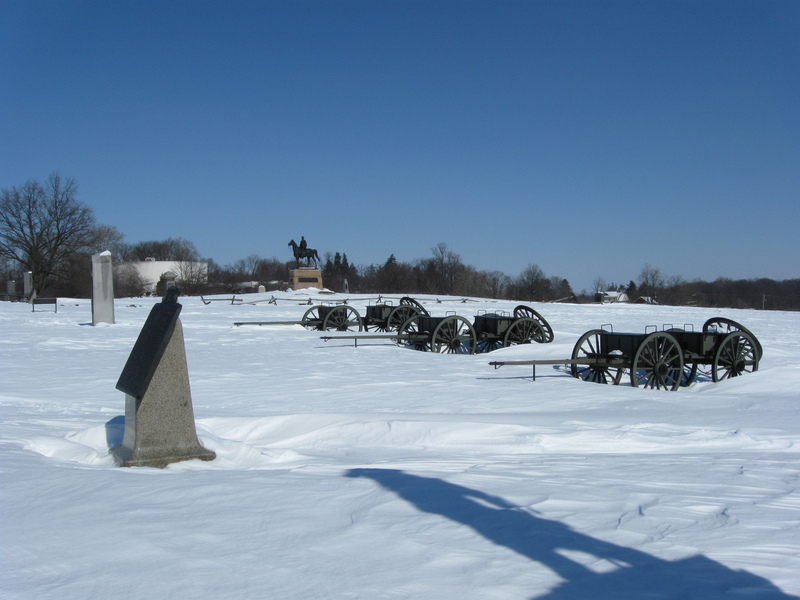 The caissons for Cushing’s Battery, and the equestrian statue of General Meade. The shadow is from the monument to General Webb. This view was taken facing northeast at approximately 1:00 PM on Friday, February 12, 2010. A closer view of the caissons. 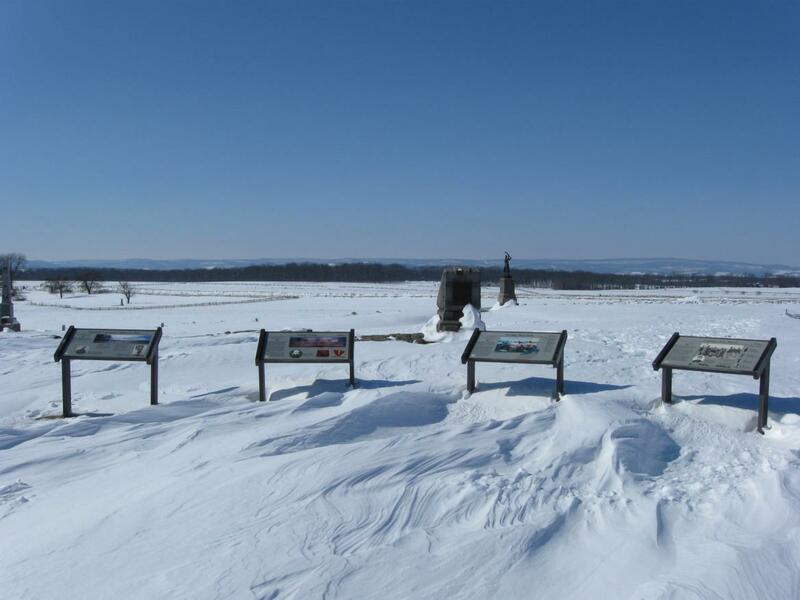 This view was taken facing northeast at approximately 1:00 PM on Friday, February 12, 2010. Back to Cushing’s limbers on the west side of Hancock Avenue. 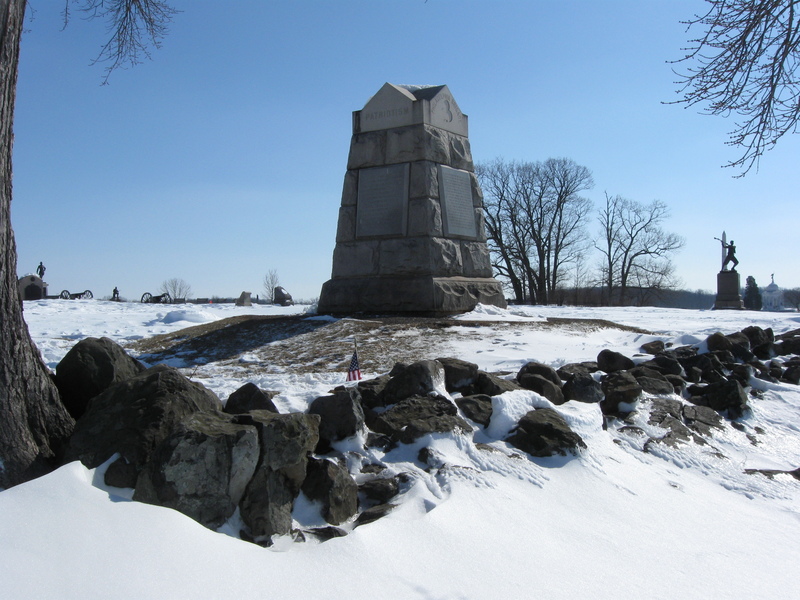 The marker to the right of the Angle sign is to Captain John Hazard’s Artillery Brigade. This view was taken facing west at approximately 1:00 PM on Friday, February 12, 2010. We’ll start walking towards the Angle. This view was taken facing west at approximately 1:00 PM on Friday, February 12, 2010. The inner Angle of the stone wall and Arnold’s Battery A, First Rhode Island Battery. 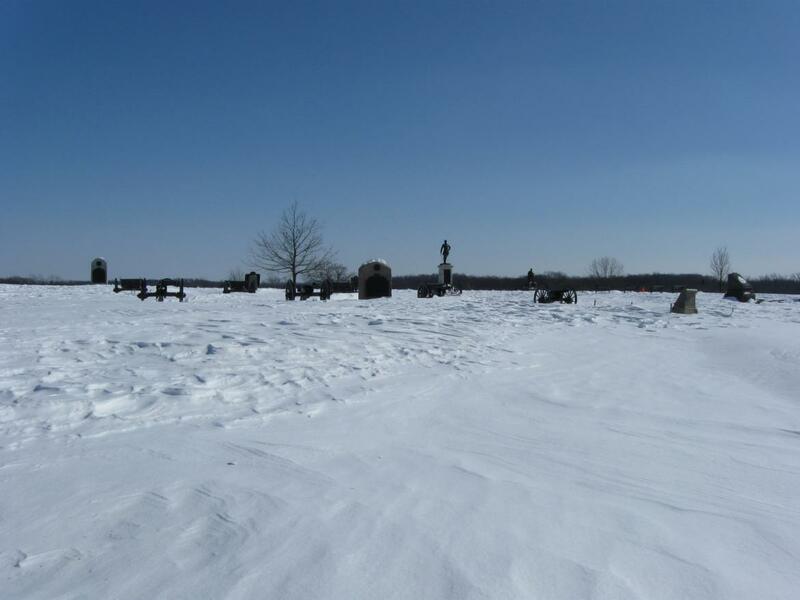 This view was taken facing northeast at approximately 1:00 PM on Friday, February 12, 2010. 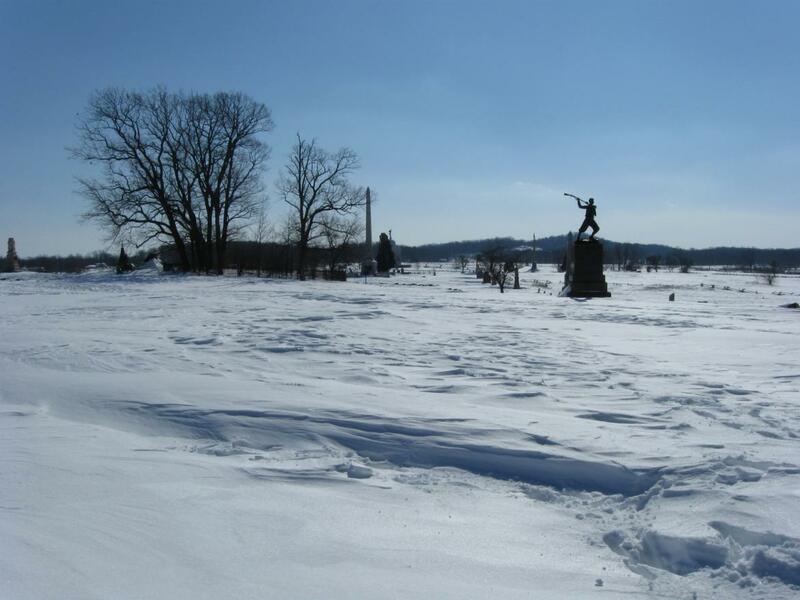 Arnold’s Battery, the Meade equestrian statue, and the pinkish monument in the snow is to the 26th North Carolina Infantry Regiment. 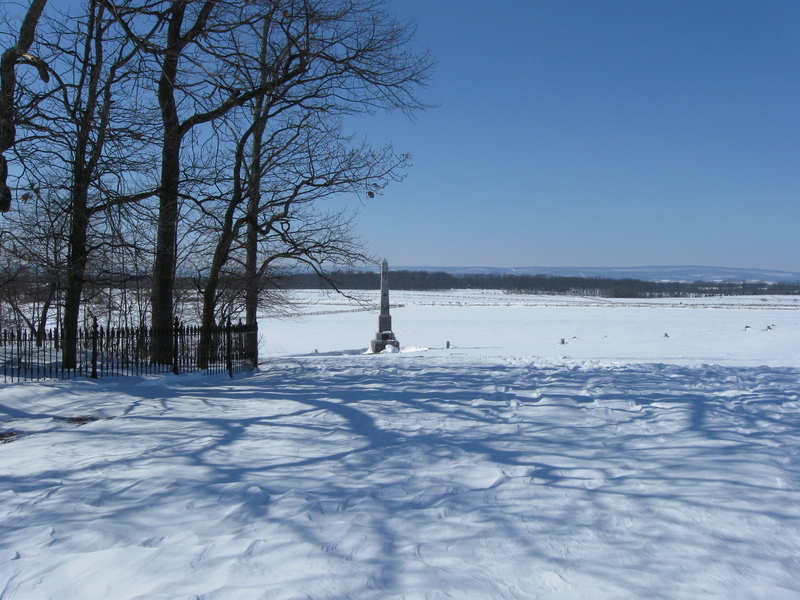 This view was taken facing northeast at approximately 1:00 PM on Friday, February 12, 2010. The stone wall running from the inner Angle to the outer Angle where the tree is located is barely visible beneath the taller brown grass. This view was taken facing west at approximately 1:00 PM on Friday, February 12, 2010. Some people had been here before us. This view was taken facing west at approximately 1:00 PM on Friday, February 12, 2010. 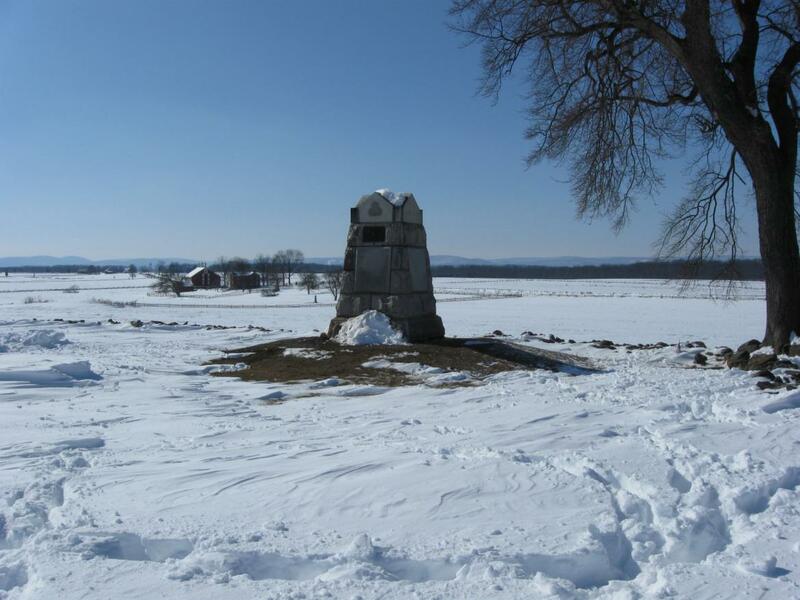 The monument to the 71st Pennsylvania Infantry Regiment. The Codori Farm is int he background. 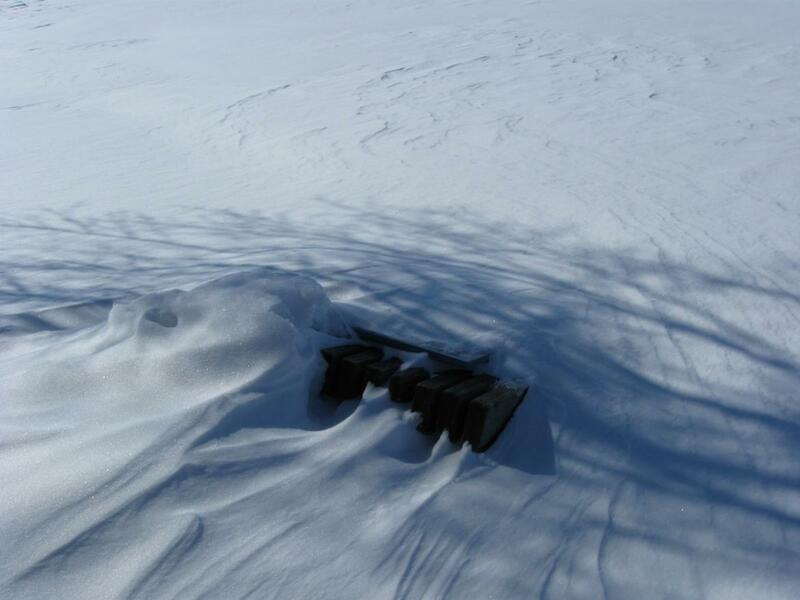 This view was taken facing southwest at approximately 1:00 PM on Friday, February 12, 2010. Looking down the stone wall towards the Round Tops. 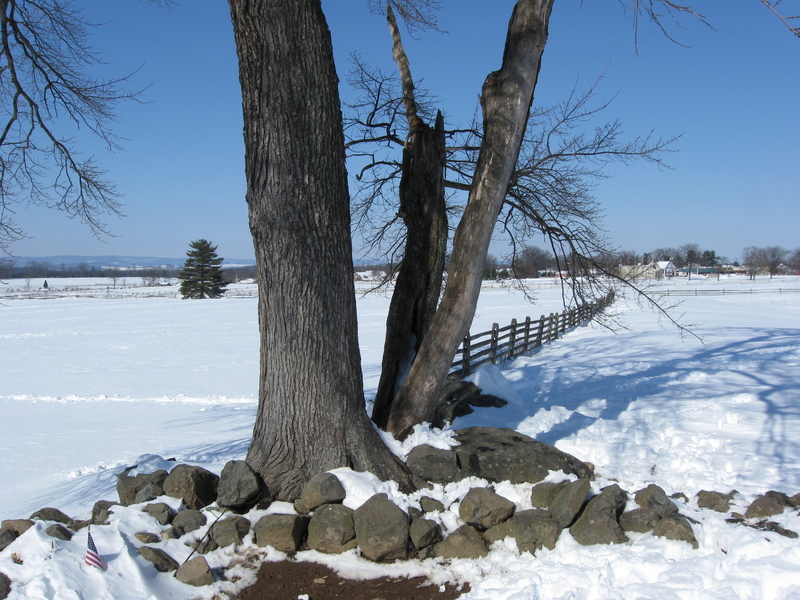 Notice how the snow on the right (west) side of the wall is similar to the same height as the snow on the left (east) side of the stone wall. This is going to be a problem. This view was taken facing south at approximately 1:00 PM on Friday, February 12, 2010. We want to take a panorama in this area, but we don’t want anything blocking our view to the west, so we need to go to the right or west of the wall. This view was taken facing south at approximately 1:00 PM on Friday, February 12, 2010. 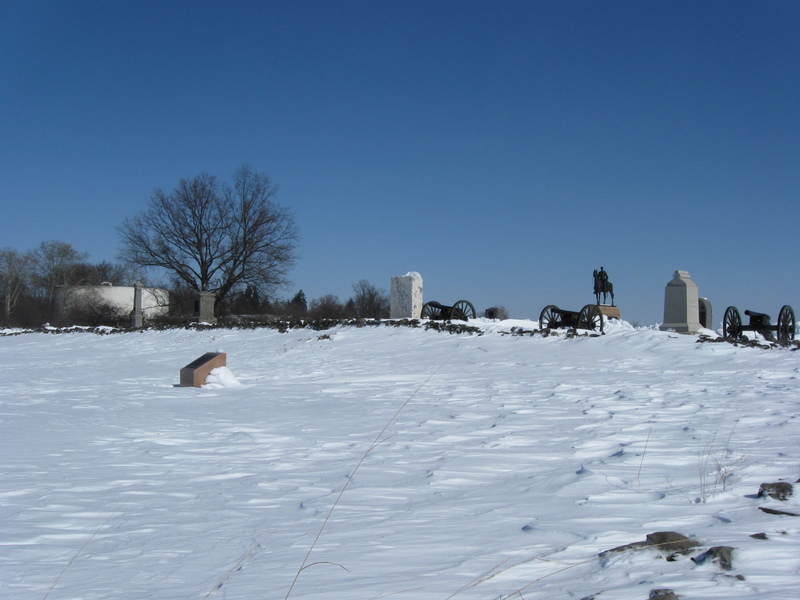 Like an idiot, we decided to jump down on the other (west) side of the wayside exhibit buried here by the snow. The snow was almost up to our chest. 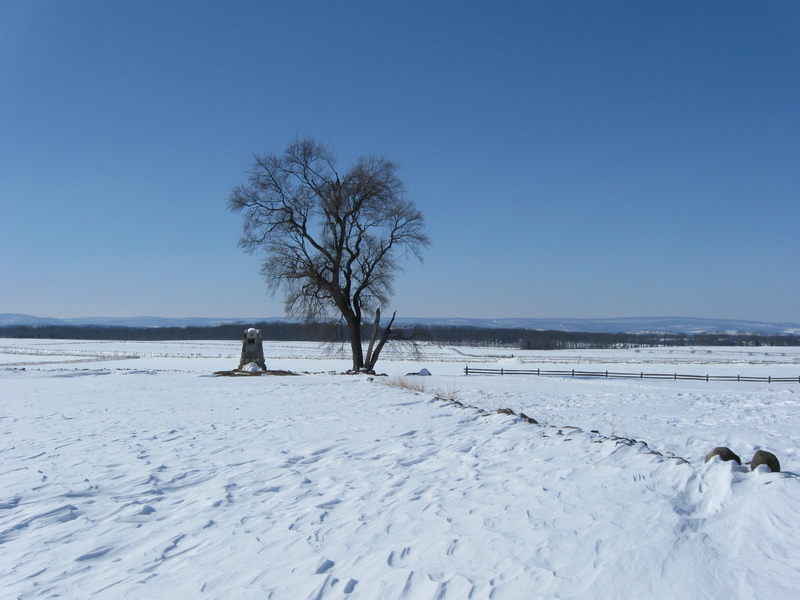 It was from that spot that we took the Angle Panorama which we showed you on Sunday, February 14, 2010. This view was taken facing west at approximately 1:00 PM on Friday, February 12, 2010. Finished with the panorama, it was time to dig ourself out and make our way back. Here’s the 71st Pennsylvania Monument. 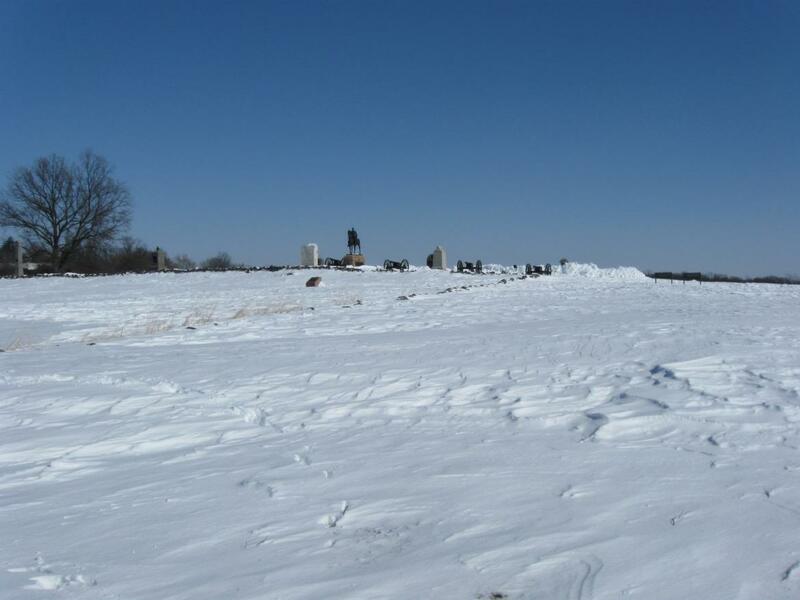 This view was taken facing southeast at approximately 1:00 PM on Friday, February 12, 2010. Here’s our “artsy” picture taken from the tree growing out of the angle of the stone wall. This view was taken facing northeast at approximately 1:00 PM on Friday, February 12, 2010. 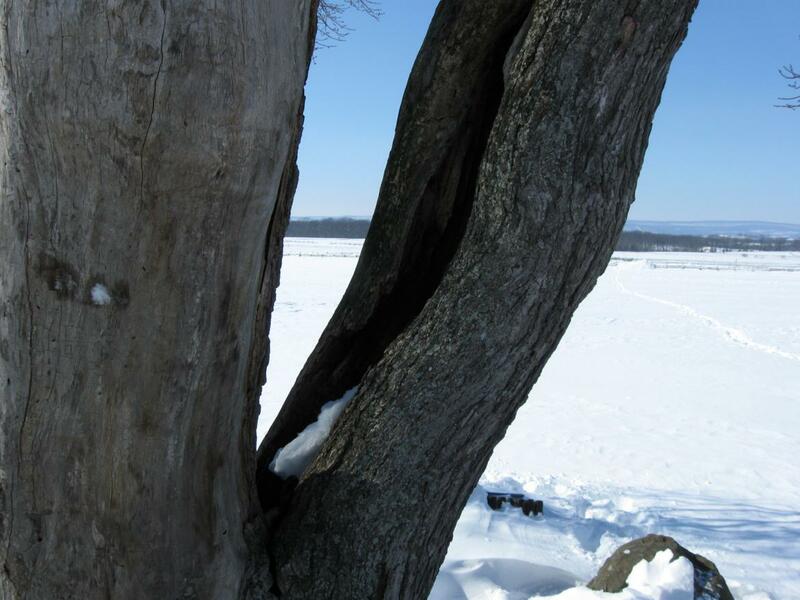 Have you noticed lately how hollow this part of the tree is? This view was taken facing west at approximately 1:00 PM on Friday, February 12, 2010. One wonders how long the NPS will leave this non witness tree up before they feel it’s a safety hazard. This view was taken facing northwest at approximately 1:00 PM on Friday, February 12, 2010. 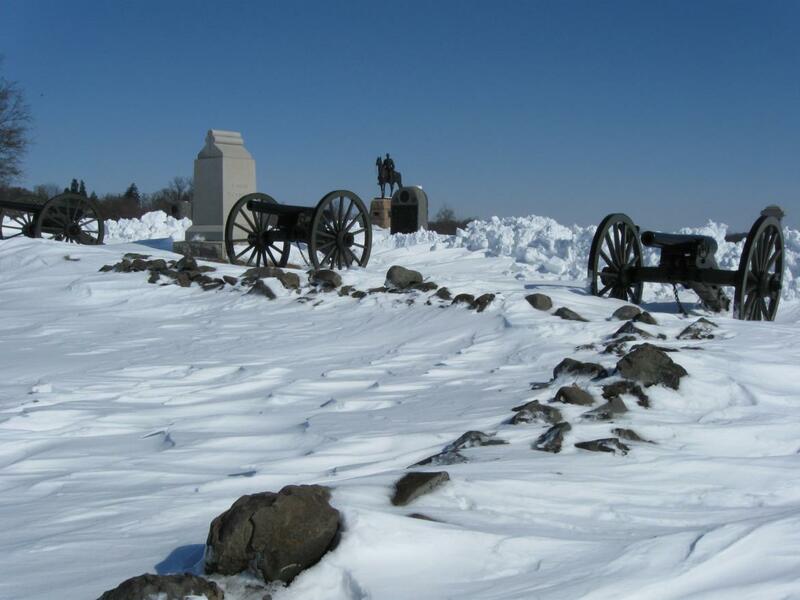 We’ll head back towards Cushing’s Battery. 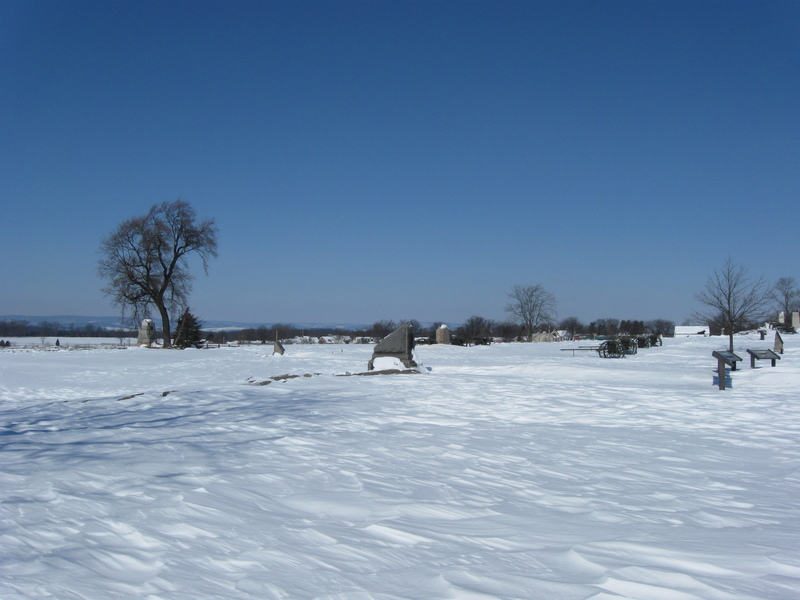 This view was taken facing southeast at approximately 1:00 PM on Friday, February 12, 2010. This view was taken facing south at approximately 1:00 PM on Friday, February 12, 2010. 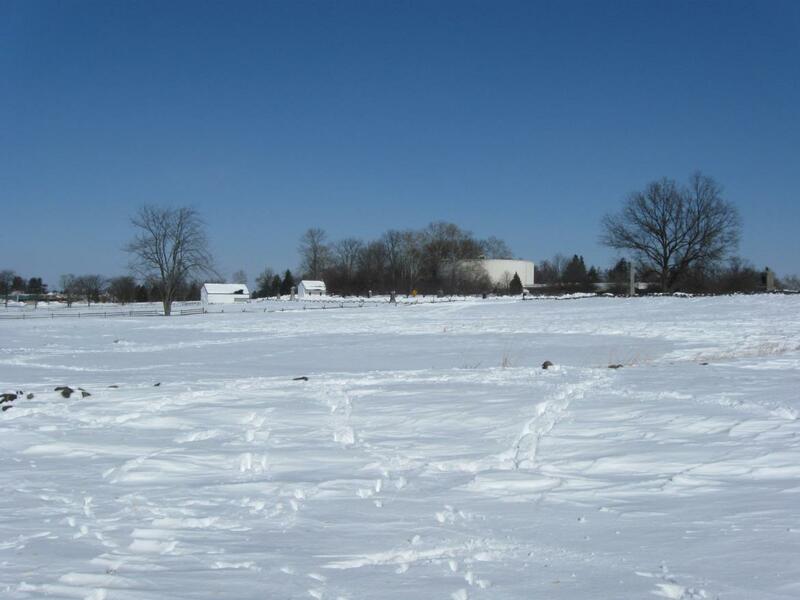 The old Cyclorama building and the white buildings at the Bryan Farm are in the background. This view was taken facing northeast at approximately 1:00 PM on Friday, February 12, 2010. 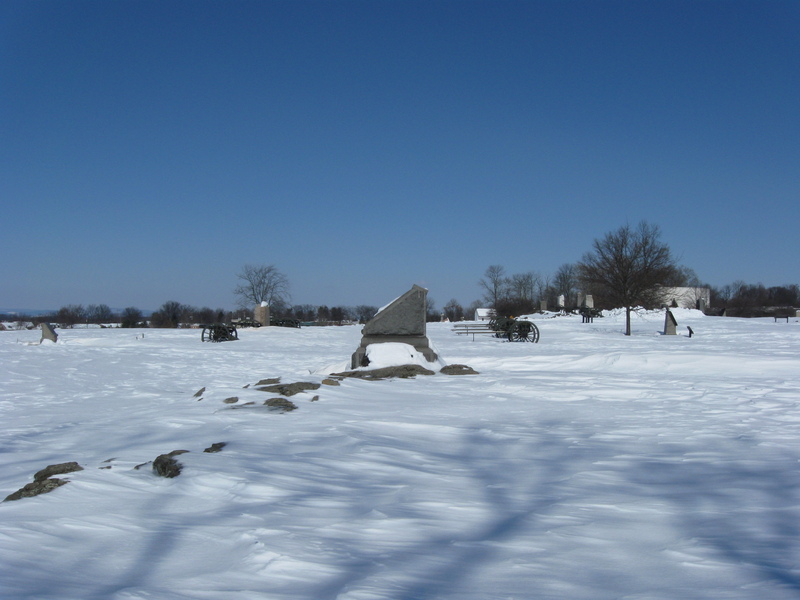 This view was taken facing northeast at approximately 1:00 PM on Friday, February 12, 2010.